2015 FIVB Volleyball World League winners France will be among the teams competing at the men's European Olympic Qualification Tournament in Berlin, Germany. Luxembourg, November 5, 2015 - Fans can start looking forward to an exciting week when the European Olympic Qualification Tournaments take place in January. 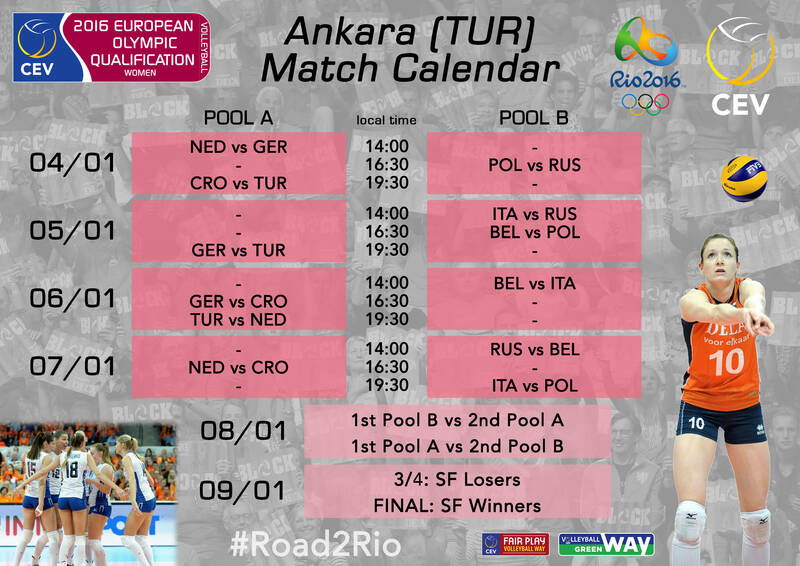 The men's teams will play in Berlin, Germany, while the women's will be in Ankara, Turkey. The women’s competition at Baskent Volleyball Hall in Turkey’s capital will get underway on January 4 with a match starring 2015 European silver medallists the Netherlands against Germany. Reigning European champions Russia will take on Poland. The programme of the first competition day will end with hosts Turkey playing Croatia. Italy - who are resting on Day 1 - will take to the court on January 5 for a remake of their quarterfinal match from the 2015 women’s EuroVolley, where they lost to eventual gold medal winners Russia. Belgium’s Yellow Tigers will debut on the same day against Baku 2015 European Games silver medallists Poland. The pool phase of the women's competition will come to an end on January 7 and will be followed by crossed semifinals before the competition reaches its climax on January 9 with the third place match and the final, whose eventual winners will secure a ticket to the 2016 Rio Olympics. The runners-up and the third-placed team will have one more chance to qualify for next year's Summer Games via the FIVB World Olympic Qualification Tournament which is due to take place in May / June 2016 in Japan. The men’s European Olympic Qualification Tournament will take place at Germany’s state-of-the-art Max-Schmeling-Halle in Berlin. Finland and reigning Olympic champions Russia will open proceedings on January 5 before hosts Germany play Belgium in a re-run of their matchup during the 2015 men’s EuroVolley, which the men captained by Jochen Schöps claimed in three sets. A star-studded match starring Serbia and reigning world champions Poland will bring the first competition day to a close. Bulgaria, after resting on Day 1, will make their debut on January 6 playing Finland. 2015 FIVB Volleyball World League winners and European gold medallists France will first take to the court on Day 2 for a match against Russia. The pool phase of the men's competition will end on January 8 and will be followed by crossed semifinals before the competition reaches its climax on January 10 with the third place match and the final, whose eventual winners will secure a ticket to the Rio 2016 Olympics. As in the women’s competition, the runners-up and the third-placed team will have one last chance to qualify for the Olympics via the FIVB World Olympic Qualification Tournament which is due to follow in May / June 2016 and which will take place in Japan. 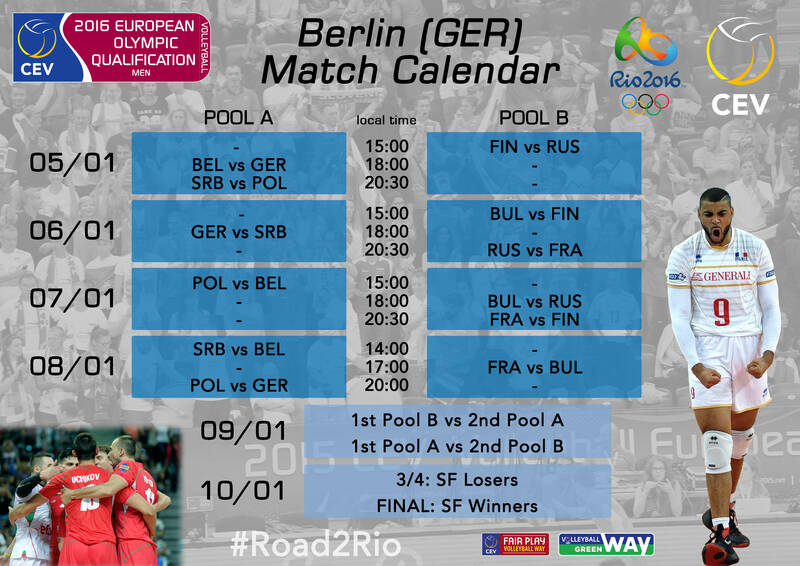 The two European Olympic Qualification Tournaments feature the respective hosts (Germany for the men's competition and Turkey for the women's) plus the seven highest ranked teams from the latest European Ranking List for men’s and women’s national teams, which was released after completion of the 2015 EuroVolley. Serbia’s women's team and Italy’s men's team have already secured their participation in the Rio 2016 Olympics by finishing second at the 2015 edition of the FIVB Volleyball World Cup held earlier this year in Japan. Don't forget to use the official hashtags #Rio2016 and #Road2Rio to follow the competition on social media.